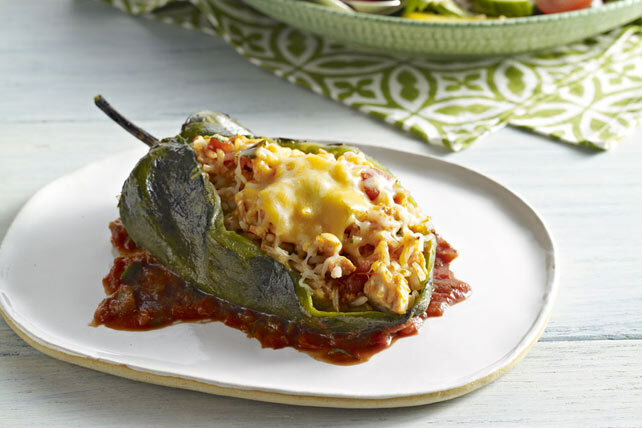 This simplified version of the classic Chile Rellenos dish features large poblano peppers stuffed with chicken, cheese and chunky salsa, then baked until hot, melty and delicious! Heat oven to 350ºF. Mix salsa, cilantro and cumin in medium bowl until blended; spread half onto bottom of 8-inch square baking dish sprayed with cooking spray. Add chicken, rice and 3/4 cup cheese to remaining salsa mixture; mix well. Spoon into chiles; place in prepared dish. Sprinkle with remaining cheese. Hold roasted chiles under running water, then peel away blackened skins with small sharp knife. Prepare using 4 small green or red peppers instead of the poblano chiles.